Lord North Star is actually VishwaBaghu, a demon. Long back, there was a time when the Devas were weaker than the demons or Asuras. They pondered over their weakness and tried to find a way to overcome it. They prayed for help from the Gods. Lord Vishnu advised them to get the divine Nectar from the deep Ocean of the Universe, which will bestow strength and immortality to anyone who drinks it. He also asked the Devas to strike a deal with the strong Asuras to share the workload and the Nectar, as churning the Divine Ocean was no mean task. With the upturned mount Meru as their churning pestle, the divine serpent Vasuki as the rope, the Devas and Asuras started churning the Milky Ocean. When the Meru toppled, Lord Vishnu took the form of the Giant Tortoise, dived into the churning Ocean and upheld the Meru. First came a sea of poison in a blue haze, threatening the life of everyone. All the creatures started praying for help. Lord Shiva swallowed the whole lot of poison without hesitation, in a hurry to save everyone. Goddess Parvathi, couldn’t bear to see Her husband sacrificing Himself, and immediately placed a stronghold on His neck. The poison was not swallowed and stayed in His neck, adorning it with its color, blue. Hence He is also called as Lord NeelKant (Blue Throat). Later many riches and divine forms like the Kamadenu, Goddess Lakshmi arose which were shared by the Devas and the Asuras alike. At last, the Lord Dhanvantri arose, holding the pot of divine Nectar. The stronger Asuras fought for a greater share of the Nectar. Lord Vishnu now took the form of Mohini, the most beautiful woman in the Universe. Everyone fell for Her charms. By tricking the Asuras to wait, She fed the Devas first. But somehow, an Asura, Vishwabaghu was doubtful. He disguised as a Deva and sat between Lord Sun and Lord Moon. When he hurriedly ate his share, the Moon and Sun became suspicious and discovered his act. Mohini cut his body in half with the spoon. But as he had eaten the Nectar, he could not die. Instead, he took upon a snake’s body for his lower half (Lord Rahu/ South Star/ Dragon Tail) and a snake head for his upper half (Lord Ketu/ North Star/ Dragon Head). This is the shortened story of the divine Nectar, the rise of the North and South Stars. Both the North Star and South Star are stronger than Lord Sun, who is stronger than the other six astrological planets. After all the accomplishments, the Devas requested Lord Shiva and Goddess Parvati to perform their Celestial Dance. Also called as the Anandha Thandava (Dance of Bliss), this dance brushed off the worries, grief, and fatigue of everyone who watched it. The time when this dance occurred is called as the Pradosham. Especially the Pradosha time of 4.30 p.m. to 6.00 p.m on the Triyodashi day is considered to be very auspicious. It has the power to remove any evil misfortune. Pradosha fasting is said to be the most powerful and effective of the ritual fasts. Though this book is not a treatise on the Puranas, the detailed information is necessary to understand the power and effects of Lord Ketu and Rahu. 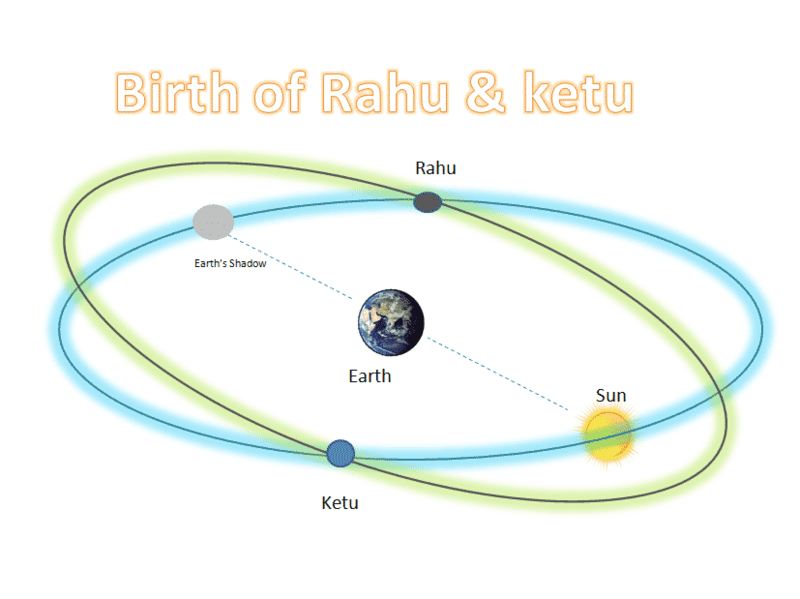 The western astrologists know of this story and hence they called the Lord Ketu/ North Star as the Dragon Head and Lord Rahu/ South Star as the Dragon Tail. In any birth chart, when all the planets are filled between Rahn and Ketu then it forms Kalasarpa Dosha. There two type of KaalSarpa Yoga | Dosha in Vedic astrology. When all the planets are filled from Rahu to Ketu, then it is Savya Kalasarpa dosha. When all the planets are filled from Ketu to Rahu, then it is Apasavya Kalasarpa dosha.